Our wonderful neighbor Ron brought over about 6 or 7 pounds of freshly caught Klickitat River salmon (filleted !). This is the quickest possible meal a working mom can make on a weeknight, and of course it’s delicious. My pesto is homemade, however, store bought tastes just as great ! Preheat oven to 375 F. Place salmon skin side down in 9×13 baking dish. 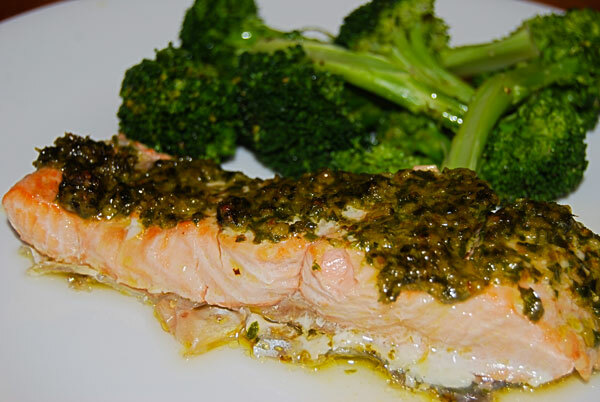 Cover top of fish with Pesto. Cook for 10-15 minutes depending on the thickness of the fish. Salmon will be cooked when you can flake away a piece from the thickest part. Mmmmm, what a great, easy way to make salmon! A native Vancouver Islander and true believer that eating enough salmon will mislead the world about my age, I am always looking for great new ideas like this! Thanks ! So darned easy.